1. Add all of the ingredients into a small mixing bowl. Stir well to incorporate the oils. 2. Transfer to an airtight container and store for up to one month. Add all of the ingredients into a small mixing bowl. Stir well to incorporate the oils. Transfer to an airtight container and store for up to one month. 1. 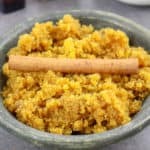 In the shower, wet your skin with warm water and apply the turmeric sugar body scrub. 2. Using a washcloth, rub your skin in a circular motion. Both sugars are great for exfoliating and the almond and vitamin E oil‘s are natural moisturizers. The anti-inflammatory properties in the turmeric powder will soothe your skin. 3. Rinse the scrub off with warm water and gently pat dry with a towel. 4. Lastly, apply your favorite skin moisturizer to seal in the moisture.